Alibaba co-founder Jack Ma moonlights as a painter, and his first piece just sold at auction for millions. 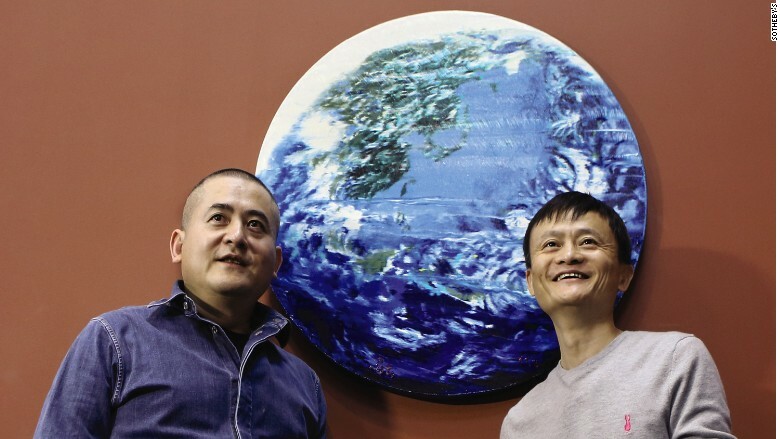 Ma painted "Paradise," a round, oil on canvas depicting Earth, with his friend and well-known Chinese artist Zeng Fanzhi. The artists coated and dotted the canvas with paint, before using palette knives to scrape the surface. "This is the first time I've painted, and to have been able to do it with Fanzhi -- I am deeply honored," Ma wrote in the auction catalog. "Together, we created an earth: to protect the earth, to protect the oceans, to protect the air, to protect water." The piece sold at Sotheby's on Sunday for about 42.2 million Hong Kong dollars ($5.4 million) -- 17 times more than estimated by the auction house -- to Chinese businessman Qian Fenglei. Proceeds from the sale are going to the Paradise International Foundation, a non-profit, environmental conservation group backed by Ma, Zeng and other Chinese philanthropists and entrepreneurs. Taking cues from Western billionaires like Warren Buffett, Ma has increasingly engaged in philanthropic work. Last year, he established a multi-billion dollar trust to fund environmental, medical, education and cultural causes in China. In May, Ma became chairman of the board for the Nature Conservancy's China program. Over the summer, he spent $23 million to buy a giant parcel of land in upstate New York, and has plans to turn it into a conservation area. Zeng and Ma's painting was on the auction block as part of a larger modern and contemporary Asian art sale at Sotheby's that brought in about 596 million Hong Kong dollars ($77 million). Among the 98 works sold were several pieces by Taiwanese sculptor Ju Ming, Japanese artist Kusama Yayoi's iconic optical dotted pumpkin sculpture, and a bicycle installation by Chinese artist Ai Weiwei.